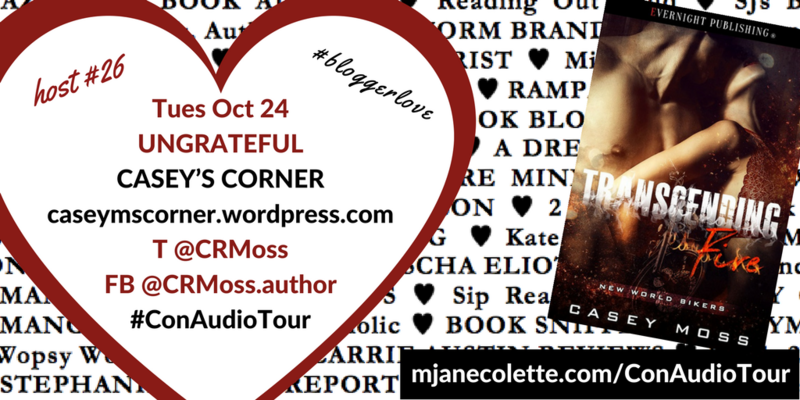 Welcome to Stop 26 and Chapter 26 of the CONSEQUENCES audioBOOK blogTOUR! If you’re in a hurry to listen to Chapter 26: UNGRATEFUL, hurry over to CASEY’S CORNER Blog RIGHT NOW! Me: Run run to CASEY’S CORNER to find out! I hope you’ve already met the amazing host of Stop 26 (and Chapter 26): Casey Moss, artist, author, blogger, and crafter, who blogs at CASEY’S CORNER, when she released her newest novel, Transcending Fire in September–I was lucky enough to feature a spotlight on and excerpt from her marvellous book (if you missed it, you can catch it here). Connect with Casey’s Corner/ CR Moss on Twitter & Facebook. And given that she’s busy promoting her own baby, I am so very very grateful CR Moss accepted my invitation to be part of the Consequences Audio Tour, and I hope her readers enjoy the taut UNGRATEFUL chapter. Thank you, C.R. Moss​ ! The rest of you, boogie on over to Casey’s Corner and check out Chapter 25: UNGRATEFUL.